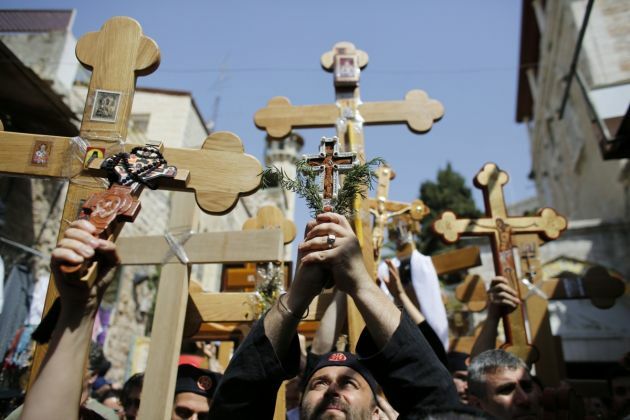 (Photo: Reuters / Ammar Awad)Orthodox Christian worshippers hold crosses as they take part in the Eastern and Orthodox Church's Good Friday procession along the Via Dolorosa in Jerusalem's Old City May 3, 2013. Thousands of worshippers retraced the route Jesus took along the Via Dolorosa to his crucifixion in the Church of the Holy Sepulcher. Archaeologists have apparently pinpointed the site where Pontius Pilate tried Jesus before a large crowd of Jews and where he may have been condemned him to death in Jerusalem. The team of archaeologists working to expand the Tower of David Museum dug an adjacent, abandoned prison structure, the Washington Post reports. As the diggings progressed in the past decade, it became apparent that the effort was significant to the history of the Holy Land. The newly-discovered site has been opened to the public for the first time, and it is expected to draw millions of religious pilgrims who converge on the site. "For those Christians who care about accuracy in regards to historical facts, this is very forceful," said Yisca Harani, a scholar on Christianity and Holy Land pilgrimage, in an interview with The Washington Post. "For others, however, those who come for the general mental exercise of being in Jerusalem, they don't care as long as [their journey] ends in Golgotha - the site of the Crucifixion," the expert added. At present, both the site and the Tower of David Museum are not part of the path of the Stations of the Cross, known as the Via Dolorosa, which is often the itinerary of Christian pilgrims to the Holy Land. Museum workers, however, are pinning their hope that with the recent discovery, tourists will include a stop to the museum and the excavation site as they make their pilgrimage there. While both scholars and theologians could not ascertain exactly whether the site was indeed the place where the trial of Jesus had been held, it appeared to check out with some known facts about the event. For instance, archaeology professor Shimon Gibson said the trial would have been held within Herod's palace compound in the western part of the city where both the museum and the site could be found. The new site also matches a detail in the Gospel of John, which describe that the trial took place on The Pavement. It also ties in with another description in the Gospel of Mark, which describe Jesus as being brought away from inside the palace. "There is, of course, no inscription stating it happened here, but everything - archaeological, historical and gospel accounts - all falls into place and makes sense," Gibson told The Washington Post.